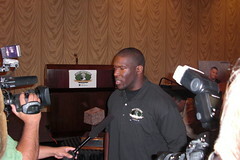 Congratulations to the Skins’ Outside Linebacker Brian Orakpo, who was named to the Pro Bowl 2010 Team today. He’ll be headed to Hawaii Miami for the only Postseason action any of the Redskins see this year (unless you count Shaun Suisham going with the Cowboys…) in the Pro Bowl. Orakpo’s 11 sacks share the team lead, and he remains the one good thing that Vinnie Cerrato did, so I suppose that’s something to be comforted by, Skins fans. Pro Bowl game is in Miami the weekend before the Super Bowl this year. They moved the Pro Bowl?! Sacrilege! Well, maybe someone will watch it this year? Congrats to Orakpo for making the Pro Bowl, but he did not make the ALL-PRO team. I don’t believe that has been announced yet – and it is a much bigger honor because it encompasses not just the NFC, but all of the NFL.